Ventricular ectopic beats are the most common cardiac electrical abnormality for which cardiologist’s consultation is sought.VPDs are one of most benign observations in ECG and and almost every heart experiences it. In 24 hour holter recordings it was reported up to 25% of healthy individuals . 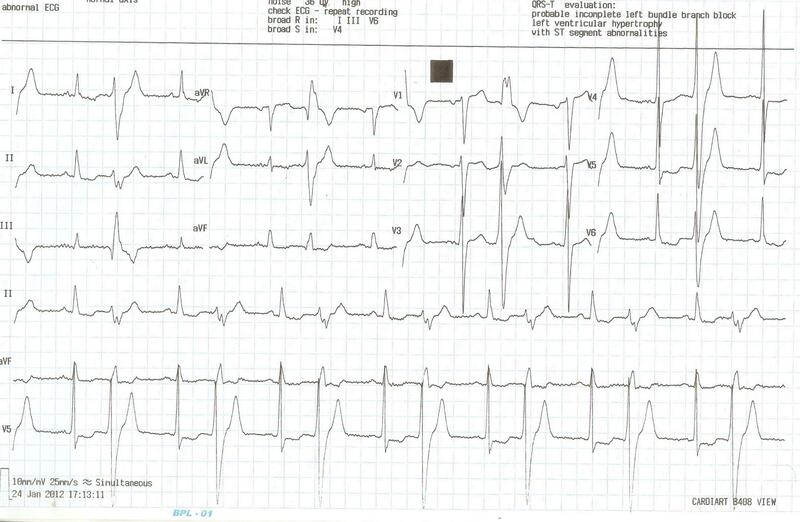 In spite of this , the fear of noting a VPD in a given tracing of ECG is genuine both for the patient and his physician.This is because VPDs can be a forerunner of dangerous ventricular arrhythmias. 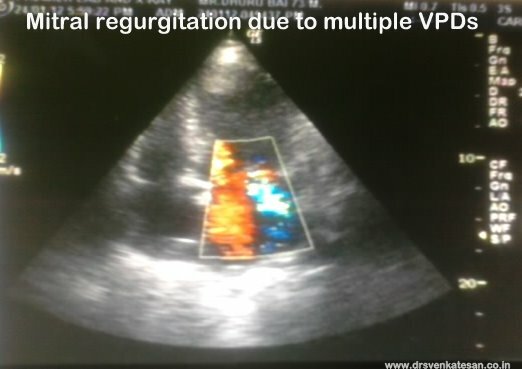 If it exceeds 30second it called sustained VT.
VT may remain as VT in many. The importance of VPDs do not lie in the number , morphology or frequency but most importantly in the underlying etiology. If it occurs in a structurally normal heart it is largely benign. New onset VPDs should be investigated thoroughly. The commonest symptom is palpitation. Friendly VPDs : Some of situations where VPDs are commonly observed and has little significance are. What are the VPDs that could be clinically important ? What prevents a non sustained VT from becoming sustained ? No one really knows the answer.Most of the NSVT self terminates.A healthy heart some how gets the capacity to self terminate the arrhythmia.The normal LV fails to sustain the abnormal electrical circuit . A diseased heart may not be able to do so . Further if there is electrolyte abnormality (low potassium), or lack of oxygen it may maintain a VT.
What are the most dangerous forms of VPDs ? VPDs that occur during acute coronary syndrome. How do you investigate patients with VPDs? General medical work up in all. 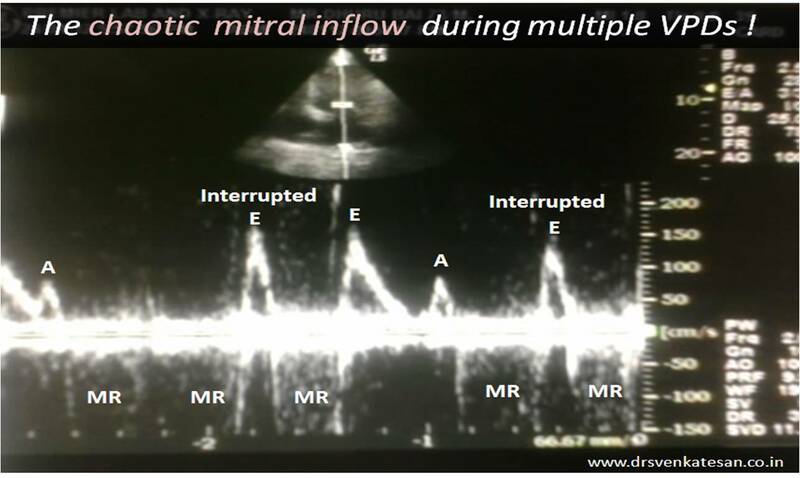 Echocardiogram is usually necessary in most. How do you manage patients with VPDs? Generally do not require any specific drugs in vast majority of individuals . Ask them to avoid potential triggers like smoke, alcohol, coffee, tea and related bevarages. Anxiolytic may also be given. *If the patient has systemic disorder like hyperthyroidsm , anemia or underlying heart disease he has to get the specific treatment. Caution:It has become fashionable for the physicians to use powerful antiarrhythmic drugs like amiodarone (Cordarone) liberally in patients with asymptomatic VPDs with structurally normal hearts.this practice must be absolutely avoided as amiodarone is one of most toxic cardiac drugs known with great pro arrhythmic activity. When to refer a patient with VPD to a electrophysiologist ? What will the Electrophysiologist do ? These patients will be evaluated for inducibility of VT/VF and if the LV function is poor (EF<30% MADIT 2 criteria ) many would receive implantable cardivertor defibrillator(ICD) or life long anti arrhythmic drugs. VPDs are the most common cardiac arrhythmia .Most of them are benign. Few of them require extensive investigation.